Firearms, including automatic weapons and gun collections, that are to be passed down to beneficiaries require special consideration and creating a revocable living gun trust may help avoid unintended consequences in the future. A gun trust is a way to legally provide for the disposition of guns to intended beneficiaries while complying with the National Firearms Act (NFA) and any applicable state laws. What Is a Revocable Gun Trust? When a revocable gun trust is established, the owner of the gun collection retains ownership and control of that collection during his lifetime. He states how the guns will be passed down to the intended beneficiaries. The gun owner appoints a successor trustee along with designating lifetime and remainder beneficiaries. He is free to make any changes or revoke the trust at any time. Similar to how a living trust states how to distribute property upon the owner’s death, a gun trust provides detailed directions on how guns should be dispersed when the owner dies. Transferring firearms can be challenging, especially with weapons that fall under Title II of the NFA like automatic weapons, short-barreled rifles, and shotguns. These items must have a federal tax stamp and be approved by a local Chief Law Enforcement Officer (CLEO). But when a revocable gun trust has been established, the transfer application is sent directly to the ATF, bypassing the local CLEO, which expedites the transfer process. A revocable gun trust makes it easier for beneficiaries to transport or handle the guns. Without a trust, the registered owner would need to be present for this, making it difficult if he or she were deceased. With the trust, the gun owner is protecting his or her beneficiaries from violating the NFA. Violations could result in prison time, steep fines and forfeiting the right to have firearms in the future. Gun dealers can provide gun owners with trust forms. However, most are standard living trust forms. They do not specifically address firearms ownership nor the legalities that improper transfer of ownership could cause. When transfers violate the National Firearms Act, the Trustee in charge of the disposition of property could be technically committing a felony. 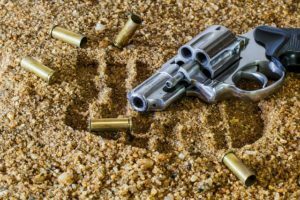 Creating a “Gun Trust” that complies with the Act is best left to a trust attorney to keep transfers legal.